Is it some character flaw that I am endlessly fascinated by conferences, conventions and symposiums - or is it, in fact, a sign of some greater depth to the world that I hope to find in these assemblies of game designers? Maybe it's both. But whenever a group of people agree to gather, to dedicate their time, to travel many miles, to sacrifice resources, interesting things are bound to happen. I can say that because I have attended such a large percentage of videogame industry conferences - not all, and not always - but enough to have a firm knowledge and a good taste for such things. Most conferences are based on the idea of informational sessions, gaining knowledge, the continuance of professional craft. Some will mention the power of networking, while others offer exposure to products or services. People want to see old friends, to have good dinners and to keep relationships strong. Some are even there for news. And you can always find a suit, chanting his professional motto and reason for being: "to get some business done." At the most recent Game Developers Conference, one senior editor was complaining to me that Shigeru Miyamoto's keynote was interesting enough, but didn't contain anything new. Yet the developer audience loved it. Why was that, and what did it say about conference attendees? Just this: Game development is an incredibly difficult vocation. The artistic and business disappointments build up. Game developers become worn down, burned out and used up. Unless they can find a salve to heal their wounds, they cannot continue. That is why they attend conferences: to find the inspiration to carry on another year. 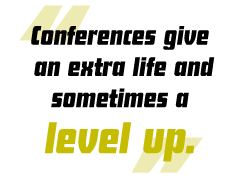 Conferences give an extra life and sometimes a level up. That's part of what fascinates me. Another part is being inside the world of the conference directors themselves. It can be as catty and high-stakes, as ingrown and desperate as anything else. They jockey calendars and file lawsuits, do mergers and acquisitions. And for whatever reason, I've always had an inside track on industry events across the world. The game industry is now without institutions. We used to have a set calendar of events, as solid as the stars above, that dictated the development schedules and social seasons. We had consecrated meeting places where industry insiders would gather and drink and talk. Much has been written about the Electronic Entertainment Expo, too much. But I don't think the full story will ever be told, about how exactly it collapsed one summer day, first behind closed doors, and then publicly as Next-Gen covered the story. The essence of that event was that, quite simply, E3 was the sound and fury of the videogame universe. What was once said of Times Square in general was true about E3 in specific: If you stood on that show floor long enough, everyone you'd ever known would walk by. Everyone got something different from the show. Some loved it, some hated it and for the remainder it was just part of business as usual. It was also the one place where you could feel part of the game industry just by standing there and looking around - because you were surrounded by colleagues from the world over. EA's Kudo Tsunoda once told me E3 was exhausting because you would go through a high-energy, 30-second recap of what you'd been up to for the last year with every friend you encountered, usually just 10 steps apart.